Now many users have heard about the performance degradation found in Intel SSDs due to the write/rewrite commands. So today we will tell you a cool third-party software that can secure erase Intel SSD with a simpler way. AOMEI Partition Assistant is a free partition software that cannot only secure erase Intel SSD but also make Intel SSD secure erase bootable possible. AOMEI Partition Assistant also supports other SSD brands such as Samsung SSD, Kingston SSD, Crucial SSD, etc. Now AOMEI Partition Assistant 6.5 has released! How to Secure Erase SSD Wizard functionality through AOMEI Partition Assistant? Step 1: Connect your SSD to the Windows 7 computer. Free download AOMEI Partition Assistant Standard, install and launch it. You will see the basic situation of your hard drives. 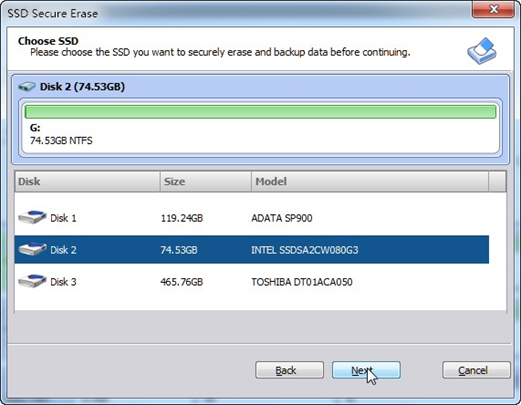 Now you need to click “Secure Erase SSD Wizard” in the left panel. Step 2: It will give you a note like the following screenshot. Read it and click “Next”. 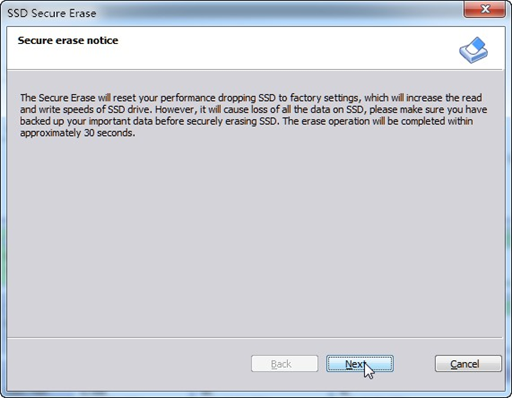 Step 3: Now you need to choose the target SSD drive that you need to secure erase. Then click “Next”. Step 4: Next, you will view the basic situation of your SSD. Remove the SATA power cable from the drive and quickly reconnect it. Unplug and plug in the SSD. With doing a hot swap, it should be relieved from the frozen state. Get back to retry from the beginning. Step5. At last, wait till the operation returns a result. AOMEI Partition Assistant Secure Erase SSD Wizard provides you a way to secure erase Intel SSD, meanwhile, it can restore Intel SSD to factory settings without any effect on its lifespan. In addition, with AOMEI Partition Assistant, you can create a partition, delete partition, format partition, resize partition, extend system partition, merge partitions, convert file system, Windows to go, creator, make bootable media, etc. Whether you need to Windows to go, merge, extend or create partitions AOMEI Partition Assistant can be a useful tool! Try it now!